Follow the adventures of storm chaser Rebekah LaBar. The Whirlwind And The Storm – Storm Chasing DVD Now Shipping! This is yet another plug for my new storm chasing DVD, “The Whirlwind And The Storm”. 102 minutes of tornado and storm action, filmed by myself, Dean Narramore, and Rob Warren. Also comes with a booklet with a bit of info on each day. I shipped out several copies of the DVD this morning, and should be able to fulfill future orders within a day or two of receiving payment. The DVD costs $20 for US shipping, $25 outside the US. At 12:01am Central Standard Time on November 8th, the price of the DVD will go up to $25 US, $30 international. Check out the trailer and purchasing information here! I will be at the National Weather Festival in Norman on Saturday, November 6th, with discounted DVDs, photos, T-shirts, calendars (all available on the website now), etc., as well as free pens! Series note: from here on out, I will skip Antarctica in the World Wide Weather continental rotation. Occasionally we may return there, but for now, we’ll rotate through just the other 6 continents. This week’s post in the global weather and climate series features International Falls, Minnesota (click for a Yahoo! maps link). There is currently a very strong extratropical cyclone centered just north of International Falls, so we’ll be taking a brief look at that today. Rainy Lake, on the Canadian border near International Falls, Minnesota. From MinnesotaLakes.net. Click to enlarge. 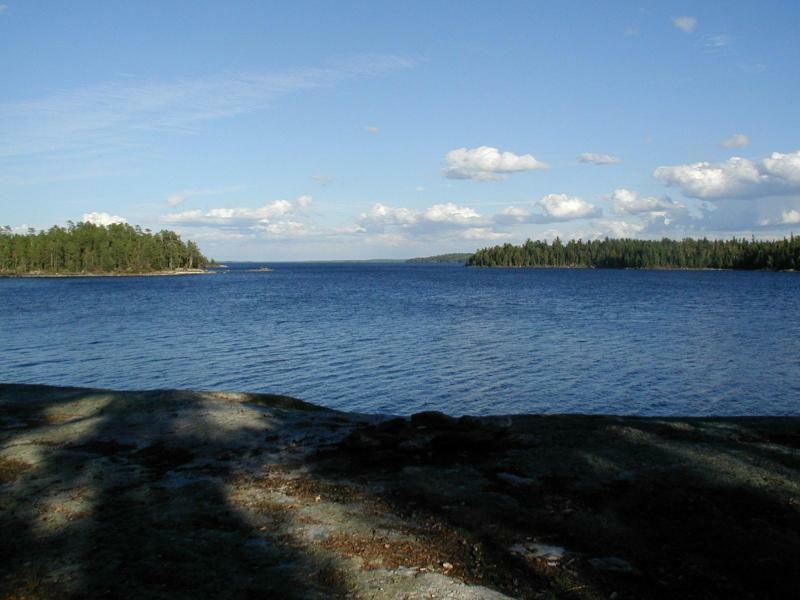 International Falls is located in northern Minnesota, just across the Rainy River from Lake Frances, Ontario, Canada. The city is officially known as the “Icebox of the Nation”, following a 2008 trademark lawsuit with Fraser, Colorado. International Falls receives bitterly cold and snowy winters, but humid and hot summers. Settlers first arrived in the area in the 1600s, but the city did not become incorporated until 1909. The population (census 2000) of International Falls is 6,703. As you can see, there is a large low-pressure system centered just north of the Canadian border, with a very tight pressure gradient (the lines on the map are isobars, lines of equal pressure). Note how the contours are so close together. Note also the low pressure–on this map, the pressure at International Falls was 959 mb! Actually, this extratropical cyclone set new minimum, non-tropical pressure records in Minnesota and Wisconsin as well as the US as a whole. So aside from landfalling hurricanes, this system brought the lowest pressure ever recorded over the US mainland: 956 mb! This is the equivalent pressure of about a Category 3 hurricane! The pressure is so low, and the pressure gradient is so tight, the winds around the low are very strong. There have been some gusts to well over 60 mph in the Upper Midwest. Today has also been an active severe weather day, as storms have formed all along a cold front as well as out ahead of the cold front, producing high winds and tornadoes. As I mentioned yesterday, if the air behind this system was just a little colder, there would be the potential for a major blizzard over the Northern Plains. As it is, there is some snow falling (see the Weather Channel map, above), but not enough for a big blizzard. For weather maps and information on current and forecast International Falls weather, see the National Weather Service and Weather Underground. For more information on International Falls, here’s a link to Wikipedia and here’s a link to the city’s webpage. Next Tuesday I plan to take a look at the climate and weather in another part of the globe. As always, if you have any comments or suggestions for future cities, please leave a comment! Surface observations at 11 am Central Time, from the Oklahoma Weather Lab. Click to enlarge. 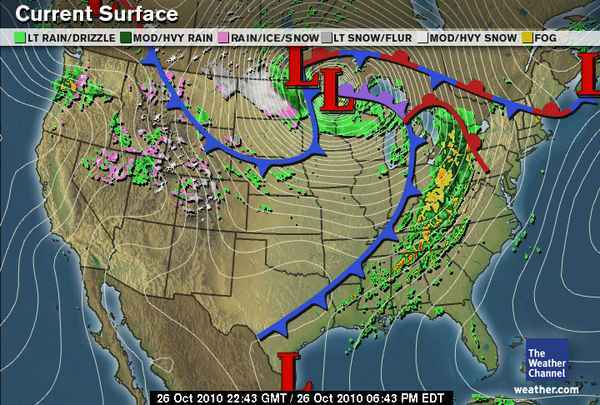 A surface map of the U.S. right now shows an elongated area of low pressure over the Great Plains. The lowest pressure on this map is 984 mb. This low pressure system is expected to rapidly strengthen today and tonight, and could even bomb out. A bomb cyclone is a mid-latitude cyclone with a pressure that drops by 24 mb in 24 hours…the GFS model (below) shows that the pressure of this cyclone could get down to 960 mb in about 24 hours. GFS model valid at 18Z (1 pm Central Time) Tuesday, showing surface pressure and temperature. Click to enlarge. When the pressure gradient becomes this strong, the wind speeds increase. High wind watches have already been issued for much of the Midwest. The National Weather Service says that sustained winds of 4o to 50 mph are expected behind this low pressure system, and gusts could get to 55 mph late tomorrow. A cyclone that strengthens to 960 mb over land does not happen very often. If this same cyclone occurred in another month or two, there would likely be a big blizzard. However, the air behind the cold front associated with this system is not quite cold enough for snow just yet. The Storm Prediction Center issued a slight risk for severe weather today, with a 5% chance of tornadoes over south central Oklahoma and north central Texas. A negatively tilted shortwave trough is located through the Texas Panhandle into central Texas, with strong upper-level winds around the base and just downstream of the trough. An elongated surface low stretches from eastern Colorado into the Texas Panhandle, while a diffuse dryline, expected to tighten this afternoon and move eastward, is situated in the west central Texas Panhandle. There is a pretty significant wind shift along this boundary, with westerly winds in eastern New Mexico, southerly winds in the central Texas Panhandle, and southeasterly winds in the east Texas Panhandle. Dewpoints in Oklahoma and the Texas Panhandle are in the mid- to upper 50s, but moisture is surging north and they could get into the lower 60s later today. There is still an MCS in western Oklahoma, but the storm’s outflow boundary in western Oklahoma / southeast of the Texas Panhandle could aid in storm initiation. There is quite a bit of cloud cover associated with the MCS, which could limit heating and instability, but skies are already clearing in some areas of northern Texas and far western Oklahoma. CAPE values could reach 1000 or even 1500 this afternoon around Wichita Falls to Shamrock, Texas, and mid-level lapse rates are decent as well. Vertical wind shear will certainly not be lacking…this morning’s sounding from Norman showed a perfectly curved hodograph. 0 to 6 km shear is at 50 to 60 knots over the Texas Panhandle and northern Texas, and will maintain values close to that into the afternoon / evening. Surface winds are backed over Oklahoma and north Texas, so the chance is decent for supercells to form, if storms initiate and can maintain a solid updraft. And if supercells do form, there is a decent chance for tornadoes, given low-level wind shear and increasing moisture. I’m not completely sold on this one yet…I have stick around here ’til 1pm anyway, and I’ll make a decision at that point. As of now, my target would probably be around Wichita Falls, Texas to Altus, Oklahoma. If I go, it’ll be without streaming or being on Spotter Network, as I don’t want to upgrade my cell plan to tethering again for only one chase. However, I’ll keep you updated via Facebook and Twitter! There’s a slight chance for some severe weather this afternoon in west Texas into eastern New Mexico, including a chance for supercells, but today I’m going to focus on the risk for severe weather tomorrow. I had a quick look at the 12Z GFS and NAM, and this is what I’m seeing. There’s a stacked, closed low over Arizona right now, expected to move into eastern Colorado by tomorrow evening. Dewpoints are forecast to reach the lower 60s from Texas up into south central Kansas as surface winds will be from the south-southeast and a cold front / dryline will set up in the east Texas Panhandle. Although there will not be a ton of instability along the dryline, with CAPE values likely only in the 500 to 1500 J/kg range, there will also not be much of a cap. There will be positive vorticity advection in western Oklahoma and ample wind shear for rotating storms (the NAM has 0 to 1 km SRH of 100 to 150; the GFS and NAM have 0 to 6 km bulk shear of 35 to 50 knots centered around Wichita Falls, Texas). Hodographs in parts of western Oklahoma look pretty curved. The primary limiting factor for severe weather is the lack of instability, largely caused by cloud cover. If sufficient heating is there for surface-based storms to form, there will be enough lift and wind shear to get some supercells and possibly even tornadoes. There could be two plays on this setup: the possibly more obvious one, from around Lawton, Oklahoma to Wichita Falls, Texas…instability could be greater there and upper-level winds are stronger. The other target I’m looking at is in northwest Oklahoma, closer to the low. There could be enhanced lift there (as well as steeper mid-level lapse rates), enough to overcome the lack of instability. Bottom line: there could be a decent chance for supercells tomorrow from northern Texas (Wichita Falls area) all the way up through western Oklahoma and possibly even southwest Kansas. If conditions improve by 1pm tomorrow, I may go out chasing…provided that I can make it to my target on time. I’m having lunch with a group of students and a prospective grad student until 1, so I can’t leave before then anyway.